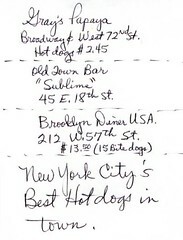 Dad gave me a list he called "New York City's Best Hot dogs in town." I have no idea where he got this information from inside his Huntsville, Texas prison cell but it's pretty accurate. I used to frequent The Brooklyn Diner with my old boss, "Jack". In fact, Jack has his name engraved on a little plaque in a booth along with the other few hundred plaques of celebrity regulars. His plaque nests comfortably alongside that of Bianca Jagger. Their menu is pricey but worth every tasty bite. Gray's Papaya is omnipresent. Cheap, reliable, decent. I'll visit Old Town Bar soon and give Dad my assessment. I wonder if he's craving a dog. It's not on the prison menu which, according to him, leaves much to be desired. He often skips meals when the food "...tastes bad. Like dishsoap in it," and sneaks extras on other days when the offering is more palatable. For my in person, contact visit in Decmeber 2005, he requested I smuggle in a Dairy Queen burger and Juicy Fruit. The burger for eating, the gum for selling at $1.00 per stick! The Brooklyn Diner is a great place for one. I love the Diner's chicken pot pie special and mac & cheese and...now I'm hungry! Kambri - your site is fantastic! I have blogrolled you, and I am sure many others will, too. One thing, might I suggest that you type in letters, too (I do like the graphic nature of the snippets of the scanned letters, it's a cool design element) it's just that the scanned letters are hard to read. Thank you so much, doggererlblogger! I'll take your tips to heart...I wondered if anyone had trouble reading them. I knew mine was hard to read because I copied it from a pdf. His letters I scanned as jpegs, so I could make them much larger. I'll give that a shot, too.